Earners will have demonstrated a deep knowledge of the caregiver role and skills required for care providers. Earners will have demonstrated an awareness of patient needs and understand the importance of interdisciplinary practices in providing care for adults as they age. They will understand that caring for older family members is an experiences that most of us have or will have in our future. Earners will have the ability to educate others on available resources for an older adult population. Complete 15 week course GERON 3220: Caregiving and Aging Families. Course is held with for-credit sections. Complete 15 week course: GERON 5390: Geriatric Care Management Clinical Issues. Course is held with for-credit sections. Complete a mentorship with a caregiver and perform a caregiver assessment to determine the needed resources and services. Develop a written plan to present to the caregiver based on the information from mentoring and the assessment process. Complete all tests, quizzes, and coursework with satisfactory grade. Earners of this non-credit micro-certificate complete all coursework, exams and projects that are expected of for-credit students. 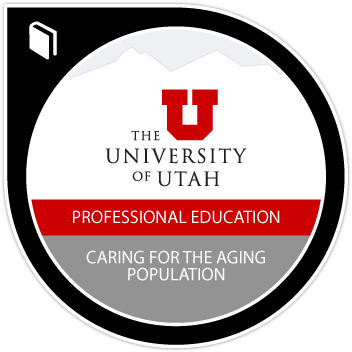 All courses align with the latest Association for Gerontology in Higher Education competencies.